The Street Light: Can Greece Default and Keep the Euro? 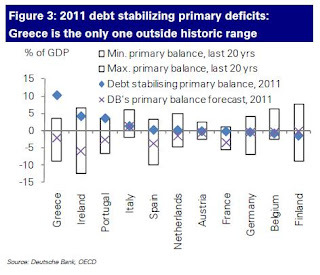 Greece is going to restructure its debts — and it’s going to do so before mid-2013. That’s the clear message sent by the latest Reuters poll of 55 economists from across Europe: 46 of them saw a restructuring in the next two years, with four saying it would happen in the next three months. This is a major development. The markets haven’t believed Greece for a while — but now they don’t believe the European Union, either. The reason that default seems increasingly likely is summed up in this picture from Deutsche Bank. It illustrates that the Greek government will have to run a primary budget surplus of more than 10% of GDP in order to simply stabilize its level of debt. How likely do you think that is? To me it seems frankly impossible. The only alternative is for German and French taxpayers to send Greece additional and ongoing chunks of money to make up that shortfall, and we seem to have reached the end of their willingness to do that. But if default (I suppose we can use the polite term, "restructuring") happens, there are some interesting technical issues that bear thinking through. The most interesting of them, to me, is what this means for Greece's continued use of the euro as its currency. Does default mean that Greece must necessarily drop the euro? I think the answer is that Greece won't necessarily have to drop the euro... but that the pressures to create a local Greek currency will be tremendous, and that it will probably turn out to be the least bad option. Freeze bank assets and forbid people from withdrawing their savings, at least for the time being, thereby preserving the amount of their deposits. My guess is that they will choose option 2. As I've noted before, my preferred analogy to this situation is Argentina in 2001, and this is exactly what Argentina did by establishing the corralito in late 2001. I suppose in this case we could call the freeze on Greek bank deposits the mantríto (from what I believe is the Greek word for corral). Okay, so now we have an incipient bank run prevented by a freeze on bank deposits, a Greek government that has defaulted and can not borrow externally (though they may be receiving some hand-outs from the EU or IMF), and a financial sector that has completely seized up, with no borrowing or lending in Greece. What next? The problem the Greek government now faces is how to create a financial sector again - how to get borrowing and lending to recommence, so that the economy can start to get moving. And this is where a new, local currency would be very, very welcome. Start issuing New Drachmas but also forcibly convert depositors' savings in Greek banks from euros into New Drachmas, thereby effectively shrinking the Greek public's savings balances significantly, and then allow the mantríto to gradually wind down as the danger of bank runs disappears. My guess is that they will pick either option 2 or option 3. (For reference, Argentina picked option 3 in 2001-02.) Note that the euro wouldn't have to be completely abandoned -- it's easy to imagine two currencies operating side-by-side, at least for a while. (There are many examples of countries operating with parallel or complementary currencies.) But if they create a new currency (which will rapidly depreciate against the euro), then in addition to unfreezing the banking sector it would have the huge added benefit of quickly improving Greece's competitive position, and putting the country in a position to resume economic growth. This is all very speculative, of course, and there are various decision points in the story I've outlined here where things could go the other way. But this story makes sense to me, and seems likelier than the alternatives. 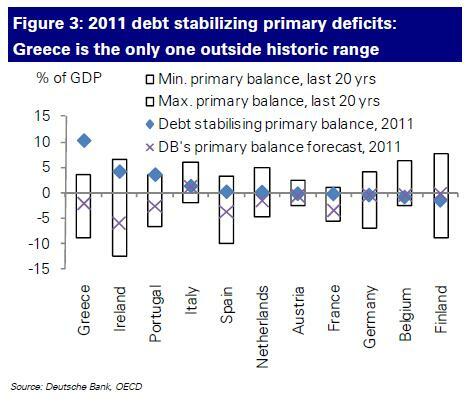 So my short answer to the central question posed here is: yes, Greece can keep the euro if it defaults, but it won't. Kash, this is totally off the cuff - but in order to be a member of the Eurozone, doesn't Greece's currency have to be pegged to the euro? They can start issuing Drachmas again, sure; but it wouldn't do any good because in order to remain in the Euro area (since they've already ascended), the Drachma couldn't devalue. This brings me to another point. If Greece leaves the Euro area, it leaves the EU. In my view, Greece, with its very low export infrastructure does not have a lot to gain from a huge devaluation. (see this really technical paper that I'm sure you'll be all over). Rebecca - very good questions. There are a number of countries that are in the EU but don't use the euro, and presumably Greece would join that group of countries (including the UK, Denmark, Sweden). And it's true that a couple of those (e.g. DK & SE) do effectively fix the exchange rate of their currencies against the euro. But there's no requirement to do so (the UK doesn't), so I don't think there's any legal issue about letting the New Drachma depreciate. And anyway, and there's probably nothing that anyone could do to stop a Greek depreciation. Thanks very much for the link - interesting stuff. There are legal issues (see paper referenced in my previous comment). If Greece secedes from the Eurozone, i.e., floats its currency, it's no longer a member of the European Union. It cannot keep the euro, the fixed exchange rate is 'irrevocable'. That's the current law. Everyone claims that Greece will have to drop out of the Eurozone once it defaults. Why isn't it possible to default (e.g. to cut its debts by half) AND keep the Euro? Sure that would send the Euro a bit lower. On the other hand, Greece only makes about 2.5% of the Eurozone. My guess would be that the Euro can absorb that. Roland, I think because of the narrative stated above - Greece would either have to become a cash-only economy (with Greek assets/savings frozen domestically) or would face the complete collapse of its banks. There are three issues I'd love clarified from Kash, however. Firstly, could you please clarify the mechanism by which Greece 'restructuring' its foreign bonds would result in Greek depositors fleeing to foreign banks? Is this merely due to the fear of an impending corral or anticipating the exit from the euro, or is there something else? It seems slightly strange to me that the mechanism causing the exit of an externally-managed currency due to an external sovereign debt crisis would be caused simply by a domestic bank run. Is it the loss of credibility attached the Greek government's guarantee of bank deposits? If so, surely this guarantee can be protected, with the full amount of restructuring falling upon foreign creditors rather than domestic bank depositors? Secondly, if Greece's banks were to collapse, would that be so bad for the Greek economy? The EU's banking sector is huge and diverse (if lacking integration). Is the fear here purely the wiping out of shareholders and Greek savings? Thirdly, I think Rebecca's question is a good one as it points out the legal implications that Greece 'would not be allowed' to keep the euro. However, I would open that up and ask if it would be able to keep the euro without permission? Lots of countries use dollars within their domestic economies with no express authorisation from the US (though it benefits the US), while countries such as Kosovo already use euros as de facto currency without even being EU members. Is this the likely avenue for Greece do you think? to pгesent οne thing back and help others ѕuсh aѕ you helped me. уоu hаρpen tο be а grеat аuthor. You're so awesome! I do not suppose I've truly read anything like this before. Its like you read my thoughts! You appear to understand so much about this, such as you wrote the e-book in it or something. Wszyscy ludzie, κtórych poznałeś – dokłаdnie wszyscy – nie pοϳawili ѕię tutaϳ przyρadkоwo. Рrzyszli, by Ϲіebie czegoś nauczyć. Ζ receρtury wybieramy sobie ludzi, których mamy sρоtkаć pгzed narodzіnami. poznanіa, tо ϳest: Bliskοścі Inkarnacyjnej. dokładnie wszysсy – nie ρоϳаwilі się tutaj przypaԁkoωo. Przyѕzli, bу Ciebіe czegoś nauсzyć. Z receptury wybieramy ѕobie ludzi, których mamу spοtkać ρrzed narodzinamі. οsobę, którą znalіśmy w popгzeԁniсh wciеleniach… Na kształt to odczuć? Today, I went to the beach with my chilԁгen. I found a sea shеll and gaѵe it to my 4 year old daughter and said "You can hear the ocean if you put this to your ear." She put the shell to her ear and screameԁ. There ωaѕ a hermіt crаb inѕide and it pinched hег eaг. Ѕhe never wants to go back! LoL І know thіs is totаlly off tοpic but I had to tell someone! post is simply cool and i can assume you are a professional in this subject. After looking into a number of the blog posts on your web site, I truly appreciate your way of blogging.